When many of us think of Normandy, France, the first thought that comes to mind is of the D-Day landing and the unthinkable horrors of WWII. 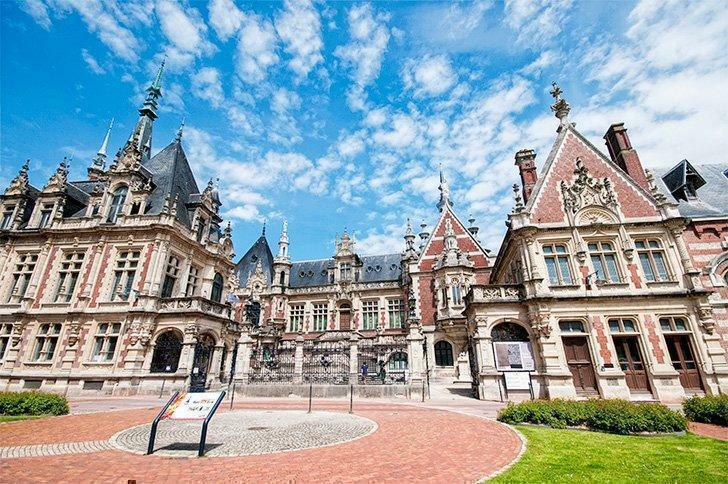 While military tourism remains a big draw to the Normandy Beaches, there is so much more to discover in this beautiful region of Northern France. From quaint villages with timber-framed buildings and thatched roofed cottages to romantic ruins and flourishing gardens, Normandy has something to offer travellers of all tastes. 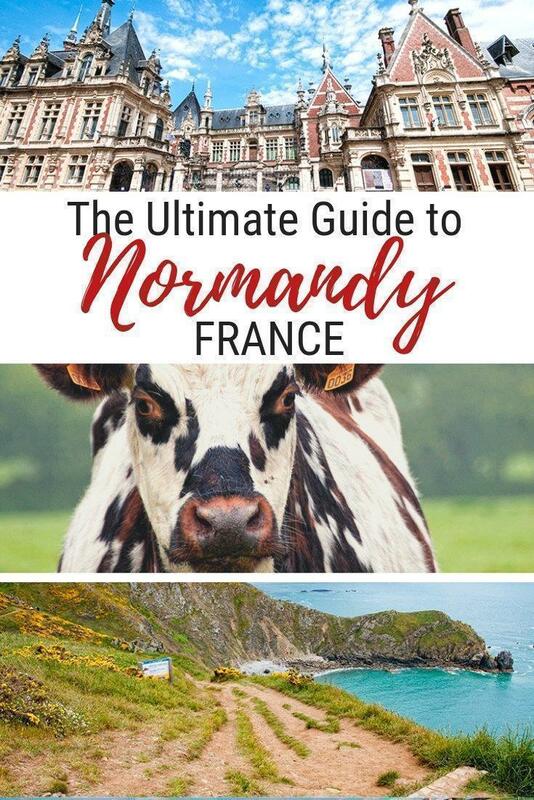 Speaking of tastes, Normandy is a foodie’s delight offering some of the world’s best dairy products, seafood, cider, and other delicious delicacies. Best of all, Normandy is the ideal road-trip destination with plenty of stunning drives both along the coast and inland through beautiful agricultural land. While there are plenty of Normandy day-trips from Paris, we urge you to take your time touring the region either by car, bike, or as we did, in our motorhome. In 2016, the regions of Upper and Lower Normandy were combined to create the new region of Normandy, France. It is situated on the northwestern coast of France between Brittany, to the south, and Hautes-de-France, to the north. Normandy sits directly across the English Channel from England and has many historical ties to its British neighbours. Normandy is made up of five departments: Seine-Maritime, Orne, Manche, Eure, and Calvados. The Prefecture (essentially the capital) of the region is Rouen, in the Seine-Maritime department. Rouen is located about 2 hours from Paris and makes an excellent base to begin exploring the Normandy region. There are loads of tourist attractions in Normandy both on and off the beaches. 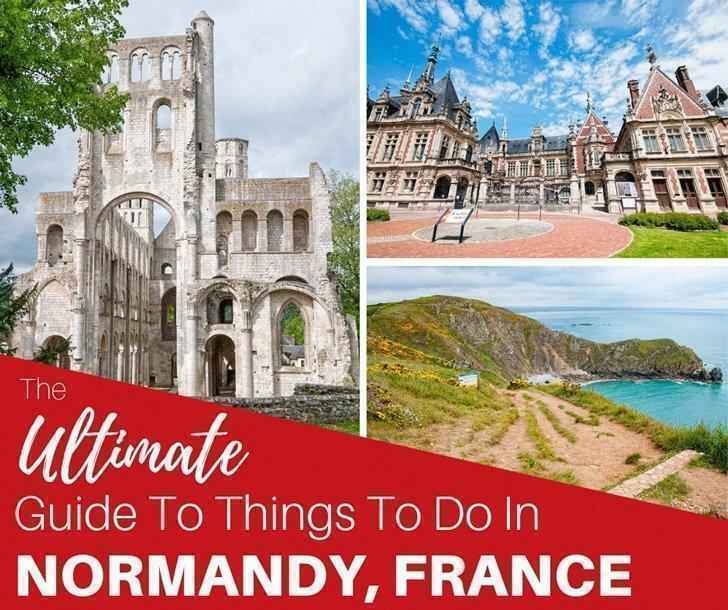 Some of the top sights in Normandy are extremely popular with visitors, but there are still plenty of places you can get off-the-beaten-path, even during the high season. 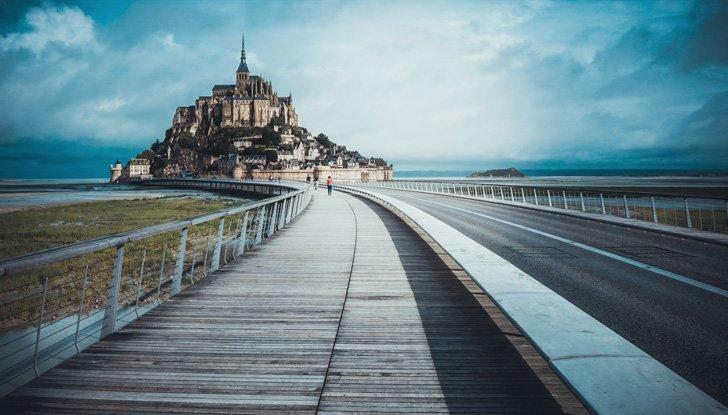 The Normandy region is home to two UNESCO World Heritage Sites, the first of which is one of the most popular attractions in all of northern France, the iconic Mont-Saint-Michel. Few sights are more atmospheric than this fortified Gothic abbey perched on an island surrounded by the frigid waters of the English Channel. The narrow streets leading up to the abbey are filled with (mostly overpriced) souvenir shops, restaurants, and ice cream parlours and can be downright heaving with tourists in the peak season. A visit to the abbey is worth fighting the crowds though, or better yet, visit during the offseason. You may find the souvenir shops closed, but the peaceful streets will be worth the chillier temperatures. [Top Tip: Skip the lines by booking your tickets online here.] Read more about Mont-Saint-Michel in our article here. At the opposite end of the coast from Mont-Saint-Michel is Normandy’s second UNESCO site, the city of Le Havre. This vast port city, with the largest container port in France, may seem like an odd place to discover cultural heritage. Make your way into the centre, however, and you’ll find a strikingly cohesive city. 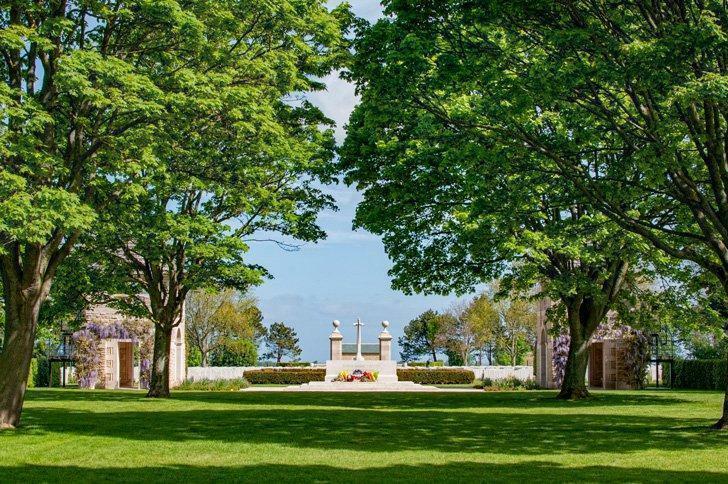 In addition to being a must-see for architecture buffs, La Havre has the second-largest collection of Impressionist paintings in France and gardeners will be awed by the Jardin Suspendus, or hanging gardens, built inside an ancient fortress. It is possible to build a week-long Normandy itinerary around WWII sites alone, and indeed, many tour operators offer these sorts of trips. While Andrew could have easily spent all his time immersed in Normandy’s battlefields and memorial sites, I had to limit my exposure to these painful places and alternate them with more upbeat destinations. Arromanches – This is where the British landed and built a temporary harbour, called a Mulberry. There is a museum here and the remains of several mulberrys on the beach. Pointe du Hoc – Site where the American Rangers scaled the cliffs to take out a German gun battery. Juno Beach – Site of the Canadian landing and home to an excellent museum that is a must visit for Canadians. Andrew wrote about each of these sites in detail in his article on the Second World War Museums of Normandy. TIP: If you aren’t able to spend more time in Normandy, it is possible to book d-day themed day-trips from Paris. Jumieges Abbey – France’s prettiest ruin in Normandy, France. In my opinion, Jumieges Abbey was one of the top attractions in Normandy and one we discovered entirely by accident. 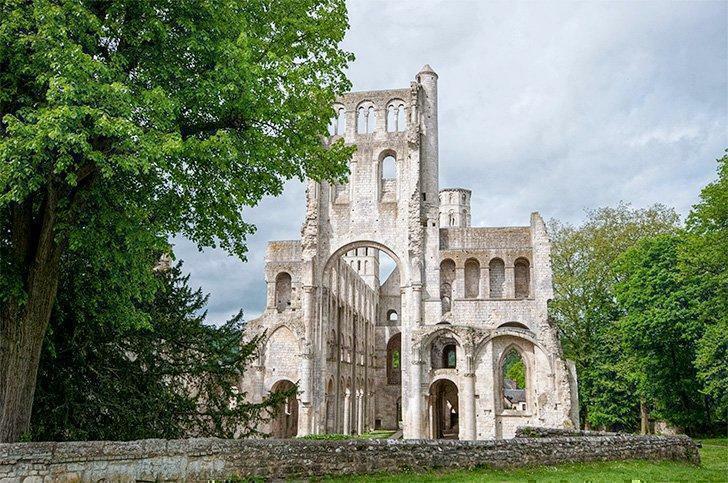 Known as ‘France’s most beautiful ruin’ this stunning abbey was visible from our campsite at a nearby farm. Having never heard of it before, I did a little research, and we decided to visit the following morning. We were glad we did. Not only was the ruin of the former abbey jaw-dropping, but the modern art installations offered a fascinating contrast to the ancient architecture. Read more about our visit to Jumieges abbey here. 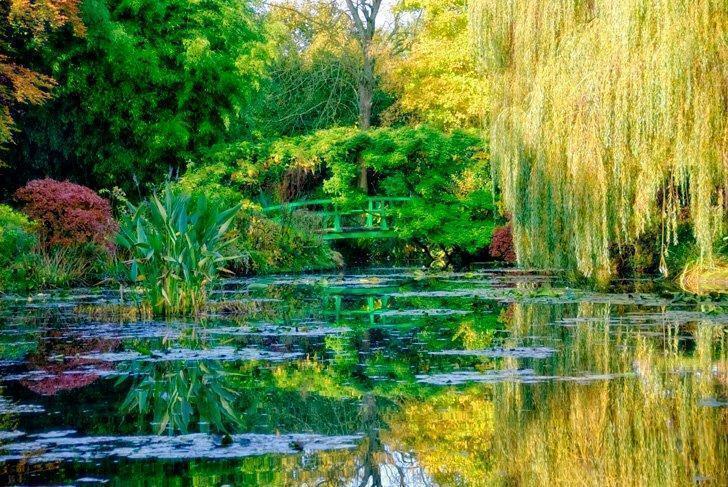 The Fondation Monet in Giverny is the second most-visited tourist attraction in Normandy, after Mont-Saint-Michel, and is a popular day-trip from Paris. If you can stay in the area and arrive early or late in the day, you can avoid some of the crowds, but the peak season can be quite intense. Nevertheless, if you love art or gardens (or both like me) standing beside the pond where Monet painted his famous waterlilies series is unforgettable. The garden is a riot of colour and wandering through Monet’s house is fascinating. There is an excellent gift shop brimming with every Monet-related souvenir imaginable and, if you have a little extra time, a stroll through the village is a nice change of pace. TIP: Skip the lines and learn more about Giverny and Monet on a guided tour. The Bayeux Tapestry was on my Normandy bucket list but unfortunately, time wasn’t on our side, so it’s one of the only sites in this guide we haven’t visited in person. Rumour has it, it will be headed to the British Museum in London sometime in 2020, so if you want to see it at its home in Normandy, do it this year. 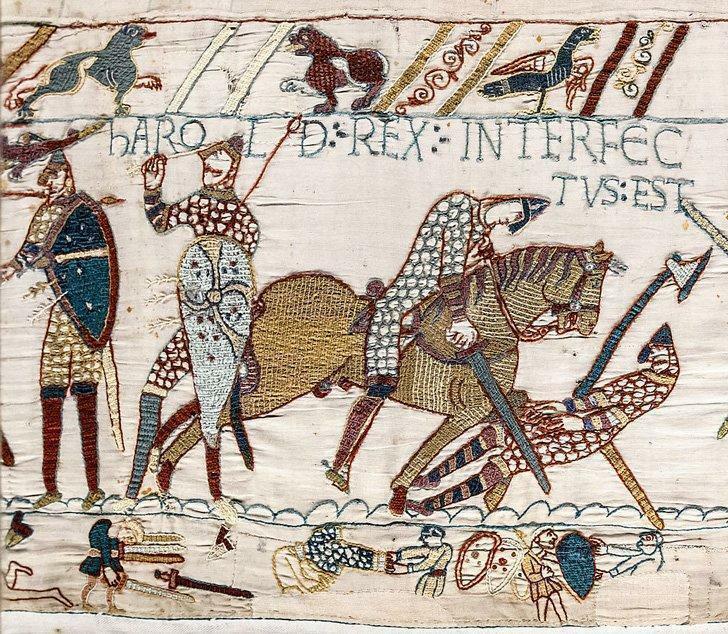 The Tapestry depicts the events leading to the Norman conquest of England ending with the Battle of Hastings. It spans 70 metres (230 ft) long and 50 centimetres (20 in) high and was embroidered in England in the 1070s. The tapestry was housed in Bayeux Cathedral for much of its 950 years but now has its own museum, the Musée de la Tapisserie de Bayeux. Like much of France, Normandy is home to a wide variety of castles and chateaux, both privately owned and open to the public. 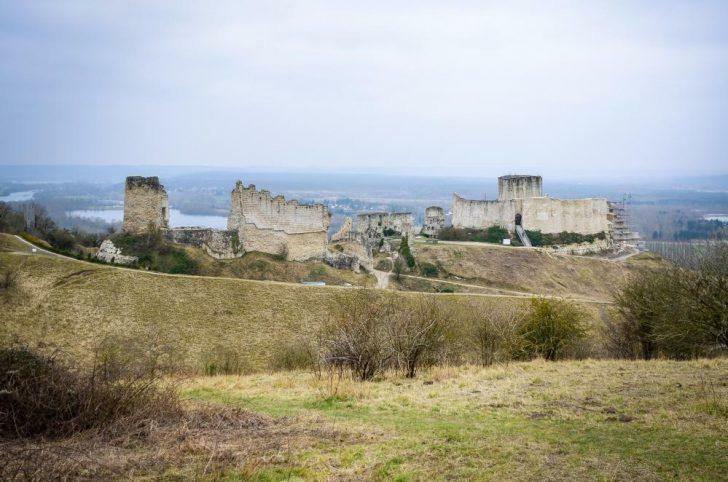 One of the best castles in Normandy to visit is the Chateau Gaillard, the stronghold of Richard the Lionheart. This medieval ruin will have you dreaming of knights and ladies as you admire it perched on the limestone cliffs above Les Andelys. The Alabaster Coast or Côte d’Albâtre is the 120km of high chalk cliffs that stretch from Le Havre to Le Treport. This is the same formation that created The White Cliffs of Dover on the opposite side of the English Channel. 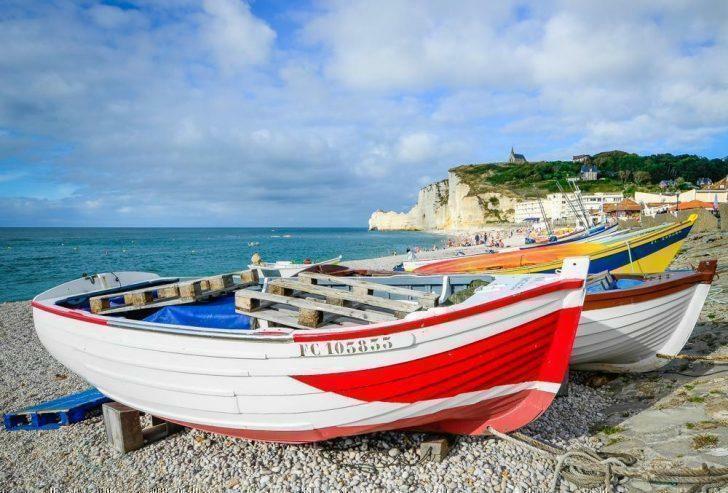 The most popular sections of this coastline are around Étretat where you can see the needle and arch formations and the charming fishing port of Fecamp. Read more about the Alabaster Coast in Adi’s article. 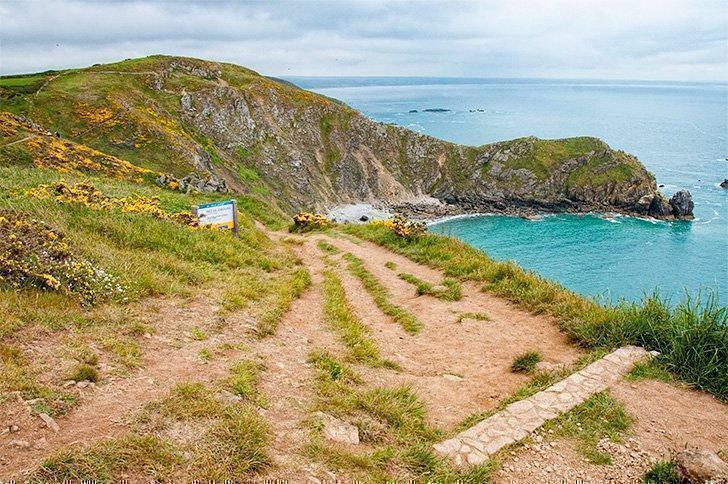 The rugged coastal trail at Nez de Jobourg in Normandy’s Little Ireland. Because of its popularity with tourists, we found the Alabaster Coast challenging to visit in our motorhome. There was little parking available for RVs, and some villages had complete bans. By contrast, we had an amazing trip around the coast of the Manche from Barfleur to the Nez de Jobourg. We explored a number of beautiful villages, stayed overnight at an oyster fishery, and explored the gorgeous scenery of the area known as ‘Little Ireland’ for its rolling green hills. There were few non-French tourists here, and we found peace and charm galore. Read about our stay in Little Ireland here. 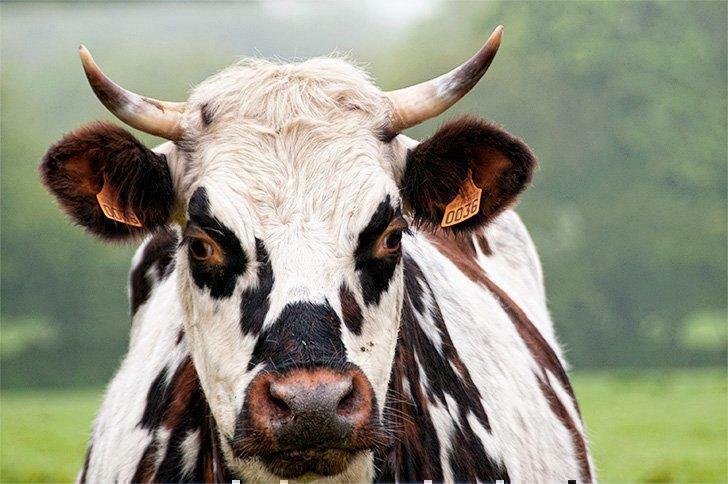 Follow the Normandy Cheese Route and meet the cows producing delicious dairy products. Ever hear of a little French cheese called Camembert? Well you can visit the namesake village in Normandy and taste camembert fresh from the farm (guaranteed to be better than anything you’ve tasted abroad.) But that’s just the tip of Normandy’s cheese iceberg. Normandy has 4 AOP (protected designation) cheeses as well as dozens of other types available – not to mention butter so good you’ll want to eat it with a spoon. You can tour cheese factories, taste your way through mind-blowing cheese shops, or go straight to the farm for your fresh dairy fix. Read all about how to spend a cheesy day in Normandy here. The Benedictine Distillery is as interesting for its architecture as it is for its liqueur. Even if you’re not particularly interested in alcohol, the Benedictine Distillery in Fecamp is worth visiting. We first learned about this unusual place in Adi’s article, and I had to see it for myself. The distillery is still the only place this liqueur is distilled much as it has been for generations and the guided tour a museum is fascinating. However, the vast mansion that houses some unusual collections (antique hinges anyone?) is truly a sight to be seen. 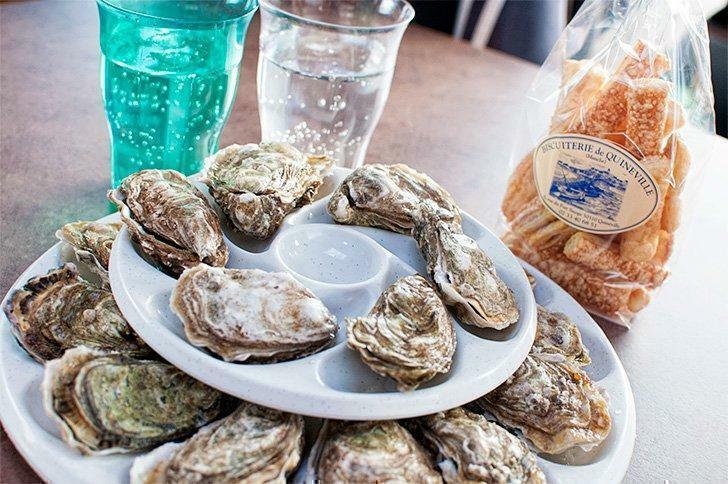 Oysters fresh from the sea are just one of the best Normandy foods you can enjoy. Normandy is one of France’s biggest producers of oysters, scallops, and mussels, all of which you can sample directly from producers or enjoy in local restaurants. When you leave the Normandy Coast and head inland, the most common sights are fields of Normandy cows (producing those amazing dairy products) and apple orchards. Apple cider (the alcoholic kind) is widely available (as are a variety of non-alcoholic fresh juices), and you can even follow the Normandy Cider Route. Apples are also used to produce brandy in Normandy, the most famous being Calvados. If you have a sweet tooth, be sure to try Tarte Tatin, a sort of upside down apple pie. Salted butter caramels can be found in just about every souvenir shop in Normandy. The most famous come from Caramels d’Isigny and have been made with the best dairy products since the 1930s. Enjoy your caramel on ice cream, crepes, popcorn, or all by itself. Timber-framed houses with thatched roofs are a common sight in Normandy, France. Normandy has six villages listed in France’s Plus Beaux Villages, or prettiest villages program. Barfleur is a charming seaside village on the northern tip of the Mache department. This traditional fishing port is a fantastic place to enjoy fresh seafood, right off the pier if you’re lucky like we were. Don’t miss strolling through the grey granite streets and stopping at the unique church dedicated to the seamen who made this port famous. 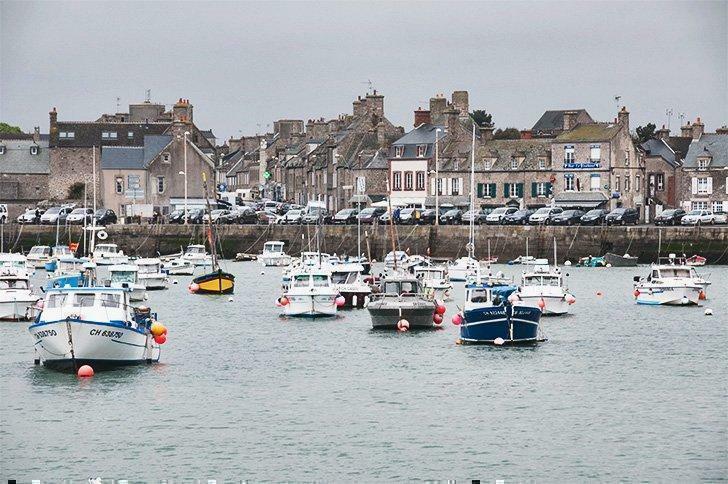 With its distinctive grey stone buildings, Barfleur is unlike other Plus Beaux Villages in Normandy. This colourful timber-framed village in Calvados is quintessentially Norman. Search for treasures in the many antique shops and don’t miss the cider festival in October. This peaceful half-timbered village in Eure is dominated by the Benedictine Abbey Notre-Dame de Bec. Religious heritage and stunning architecture make a stop to this village a must. This picturesque village in Eure was featured in the film version of Madame Bovary, and it’s easy to see why. It’s film-set like charm is highlighted by timber-framed and brick buildings featuring tea rooms, restaurants, and plenty of antique shops. This village in Orne sits on the Sarthe River and has attracted artists for centuries inspiring an annual arts festival. With a name like Veules-les-Roses, how could this village on the coast of Seine-Maritime not be charming? 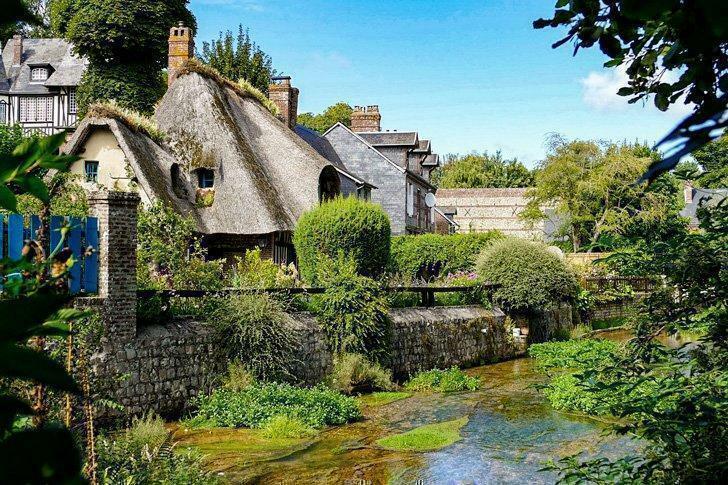 The Veules River flows through this timber-framed village and is used for growing watercress. From cosy holiday rentals to warm B&Bs to luxurious chateau stays – there are great accommodations in Normandy for all budgets. There is a vast range of accommodations from which to choose from Normandy holiday rentals to boutique hotels in Normandy. You can even treat yourself to a luxury stay in a castle in Normandy! This stunning Art Deco style hotel is just 500m from Monet’s Garden. Relax in the sunny garden terrace or soak in your own luxurious soaker tub. Rooms are unique, and the hotel offers 4-person suites, perfect for family groups. The hotel has free parking, is pet-friendly, and receives top marks from previous guests. Check rates and availability here. Le Bout du Monde is a stunning holiday home in Saint-Léonard on Normandy’s Alabaster Coast. Enjoy your morning cuppa on the terrace while watching the sun rise over the white cliffs. The one-bedroom house has a fully-equipped kitchen, wood burning stove, wifi, flat-screen TV, and you’re just a five-minute walk to the beach Check rates and availability here. 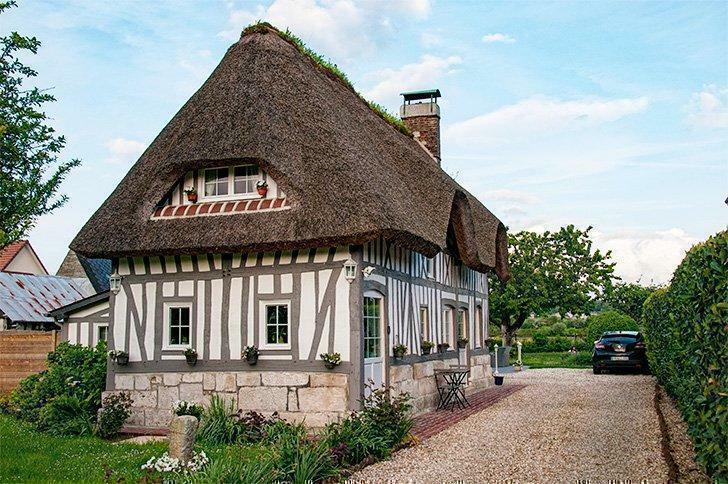 On the outside, this thatched-roofed holiday home oozes Normand charm. Inside, however, it has all the modern conveniences of a fully-equipped kitchen, gorgeous bathroom, washing machine, and satellite TV. There’s even a private Jacuzzi in the backyard. Check rates and availability here. Enjoy a romantic getaway at this cosy B&B in Etretat. Rooms have private bathrooms, and guests receive a sumptuous French breakfast that can be enjoyed on the terrace. After a long day of sight-seeing, relaxing in the soaker tub. Check rates and availability here. Halfway between Giverny and the Normandy coast, you’ll find this stunning retreat, perfect for a couple’s getaway. Au Charme du Lac guesthouse offers an indoor pool and Jacuzzi as well as beautiful views of the garden and lake. Enjoy a buffet breakfast, private bathrooms, free parking, and bar facilities. Family rooms are also available. Check rates and availability here. 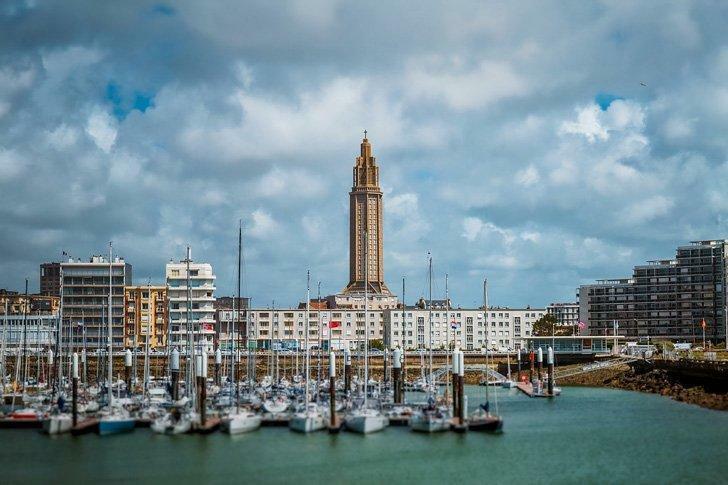 For a budget and family-friendly stay just steps from Normandy’s beaches, head to Donville-les-Bains. Les Pieds dans l’Eau is a one-bedroom apartment with a bathroom and small but well-equipped kitchen. This pet-friendly flat is just across the street from the beach, sleeps three, and includes free parking. What more could you ask for? Check rates and availability here. Just steps from the Bayeux Tapestry Museum is the cozy boutique Hotel Reine Mathilde. This small but full-service hotel features rooms ranging from twin beds to luxurious suites. The hotel offers a buffet breakfast and full restaurant with room service. There are accessible rooms available and free parking. Check rates and availability here. 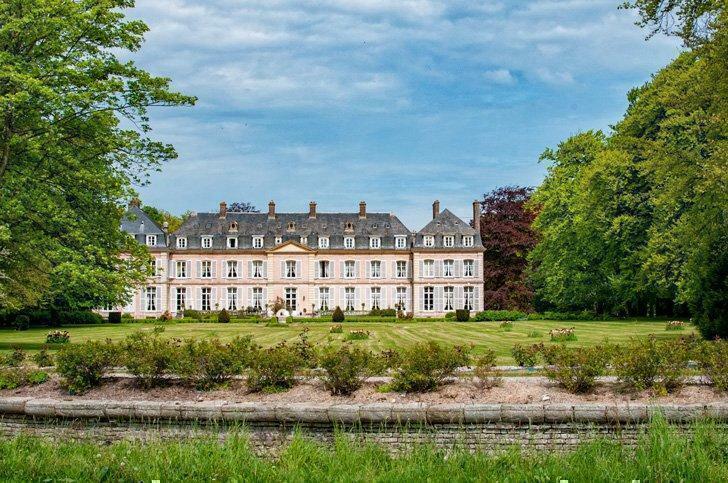 If you’ve dreamed of staying in a French chateau, here is your chance. The Château de Boucéel is just 13km from Mont Saint Michel and offers every luxury you could desire. Decorated in period furniture, you can peruse the volumes in the library or enjoy a game of pool in the games room. Stroll the manicured gardens or take a dip in the pool before enjoying dinner in the stunning dining room. Check rates and availability.